For more info on this year's award winners, check out the article from SIA. 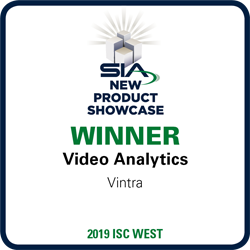 We at Vintra want to thank SIA for recognizing the cutting-edge work the Vintra team has done over the past two years in order to deliver measurably better security and safety outcomes through video analytics that work with video from any camera source to our customers. Our novel approach to video analytics truly pushes the boundaries of what's possible with video analytics! Learn more about FulcrumAI Real Time here.